White house in Washington D.C.
Are The US And Russia Neighbors? Boston is located in which state? Can a US President be Impeached? How are congressional districts drawn? How Deep is Lake Michigan? How did MS become a state? How far is east coast to west coast of the United States? How does Donald Trump's USA Looks Like? How is Thanksgiving Day celebrated in the US? How Long Does Hurricane Season Last in the US? How Many Countries Does Canada Border? How many states in US are named after people? How many US Presidents were Assassinated? How Many US States have more than One Time Zone? How wide is the United States? Is abortion illegal in any US State? Is America a Country or a Continent? Is Cancer a curse in the USA? Is Japan Richer Than America? Is New Mexico a part of the United States? Is the US Ruling the World? Is the US flag still standing on the moon? Is the Virgin Islands in the US? What are 'Green States' & what are the 'Greenest' States in the US? What are Longest suspension bridges in the US? What are Neo-Nazi groups and how are they changing America? What Are Some Important Dos and Don'ts for Eclipse Watchers? What are ten most dangerous cities in the US? What are the Americans that married royalty? What are the Ten Most Unique Buildings in the USA? What are the things Europeans find strange about America? What are the things that foreigners love about the United States? What are the Top 10 Boardwalks in the United States of America? What are the top 10 civil war battlefields in the US? What are the top 10 Longest Rivers in the US? What are the top 10 natural wonders in the US? What are the US States and Canadian Provinces that are home to the Rocky Mountains? What are the US States with the Most Pizza Stores as per population? What are the US territories? What are the US Visa types? Who are USA's biggest importers? What are the US's biggest exports and to what countries? What are US interests in Syria? What are the top 10 manufacturing hubs in USA? What are the top ten best baseball stadiums in the US? What are the best places in the US to view total Solar Eclipse 2017? What are the best places to spot Giant Pandas? What countries can a US Citizen visit without a Visa? What Desert touch the Grand Canyon? What do the Colors of the U.S. Flag stand for? What Great Lake is the only lake that does not touch Canada? What is Alabama best known for? What is Alaska known for? What is Arizona known for? What is Arkansas known for? What is California known for? What is Colorado Known for? What is Connecticut known for? What is Delaware known for? What is Flag Day, in the US? &apos;Where Liberty dwells, there is my country,&apos; said Benjamin Franklin. The District of Columbia is as emblematic of America as the broad stripes and bright stars on The Star-Spangled Banner. To understand Washington DC, one must understand the history of America. New York has soul, Los Angeles has money, and the District of Columbia has power − to reform and to lead. The capital of the United States is the hub of history and liberty, and the epicenter of politics. Kids on educational field trips or adults on casual sightseeing trips funnel here to inherit the legacy or imitate the heroism of Founding Fathers who laid the foundation the Constitution on this ground. Offering a peek into country&apos;s democratic origin, it is home to the most iconic landmarks visible on dollar bills, coins, and stamps. From Capitol Hill to U Street, Washington is a city of the people , by the people, and for the people−not just for ideologues and demagogues. Washington D.C. is located along the Potomac River on country's East Coast between Maryland and Virginia states. Ronald Reagan Washington National Airport (DCA) is the closest to downtown but has restricted flights. 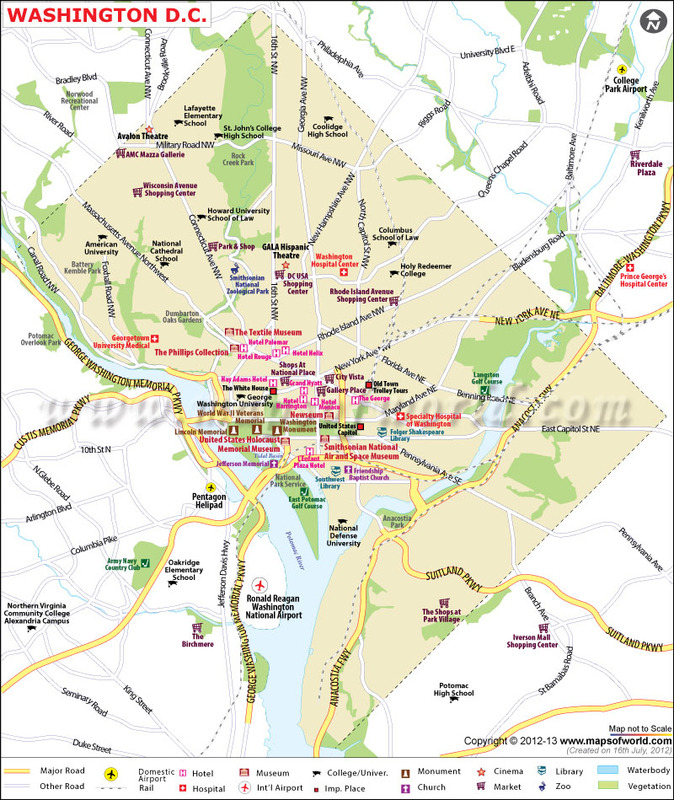 Washington Dulles International Airport (IAD) is about 26 miles west from city center. Baltimore−Washington International Airport (BWI) is about 32 miles northeast of Washington, D.C.
By Train −Washington, D.C., Union Station (WAS) is a major hub for Amtrak trains on the high-speed Northeast Corridor. Capitol Limited, Cardinal, Acela Express, Crescent, Silver Meteor, and Vermonter are major passenger trains. WMATA operates Washington Metro on six lines and regional bus system. By Road −I-495 (Capital Beltway), I-66, I-95, DC 295, and Pennsylvania Avenue are major roads for access. BestBus, Eastern Shuttle, Greyhound, and Washington Deluxe provide inter-city bus services. Although summer is a tourist-frenzy season, spring (March to May) and fall (September to November) are preferred alternative to sweltering summers and freezing winters. Places to Visit in Washington, D.C.
To rub shoulders with American history, visit following national monuments, memorials, museums, statues, gardens, and more. National Mall − Get thee to see the lion&apos;s share of the capital&apos;s famous landmarks including presidential and war memorials, most of the Smithsonian museums, and many more public buildings which lie in this national park. It extends for about two miles from the foot of the United States Capitol to the steps of the Lincoln Memorial. Walk down this historical site that has witnessed marches, concerts, and Presidential inaugurations. Go read a book in the Library of Congress, which is the largest library in the world (by collection), sit on the steps of Lincoln Memorial where Dr. King delivered "I Have a Dream" speech, contemplate in the Reflecting Pool, admire the red-sandstone facade of 'The Castle', see the official copy of 'Declaration of Independence' in National Archives Building, and reach the top of Washington Monument by night. Here are some of the famous memorials where voices so clearly echo from the past: Vietnam Veterans Memorial, National World War II Memorial, Thomas Jefferson Memorial, United States Holocaust Memorial, Korean War Veterans Memorial, Martin Luther King, Jr. Memorial, and FDR Memorial. Capitol Hill − The chief architect Pierre L'Enfant characterized the hill as a &apos;pedestal waiting for a monument." The United States Capitol is a chief symbol of the nation&apos;s capital. A huge 29-m-wide and 55-m-high 'The Rotunda' is the highlight of the Capitol building. Known as &apos;symbolic and physical heart,&apos; it features framed historical paintings and the masterpiece The Apotheosis of Washington. Its neoclassical dome, made of iron, is capped by a bronze statue − American Statue of Freedom − and the National Statuary Hall houses the sculptures of prominent Americans. White House −The official residence and principal workplace (the Oval Office) of the US President is the face of America for the world. Anyone can experience the history and art inside the house − located on 1600 Pennsylvania Ave − by self-guided tours available early morning. Museums −World-class artworks, precious artifacts, and 19 museums and galleries of the Smithsonian Institution can put any culture-seeker or history-buff in a bewilderment. National Museum of Natural History houses dinosaur exhibits and rare gems. National Air and Space Museum documents the history of aviation and space exploration with the world's largest collection. Newseum chronicles the history of news, journalism, radio, TV, and the Internet. National Gallery of Art showcases Da Vinci's Ginevra de Benci and Matisse's Open Window. National Museum of American History displays country's social, political, and cultural heritage. National Portrait Gallery, International Spy Museum, National Museum of the American Indian, and National Museum of African Art are other off-the-shelf museums with unparalleled collection. United States Botanic Garden −Its sprawling grounds feature exotic flora − from roses to orchids − and a conservatory. This plant museum is of aesthetic and therapeutic importance by virtue of rare plants. Smithsonian's National Zoo − More than 1,800 animals of 300 different species reside within its 163-acre territory. Asia Trail, Great Cats, Giant Pandas, Amazonia, and Kids' Farm are most popular exhibits here. Opened in 1889, it is one of the oldest zoos in the US and also does not charge admission. Washington National Cathedral −Built in Gothic Revival style using buff-colored Indiana limestone, this cathedral is the sixth largest in the world. Another major religious site is the Basilica of the National Shrine of the Immaculate Conception − the largest Catholic church in North America. Dumbarton Oaks −It is a famed research library and museum for Byzantine and Pre-Columbian art and European masterpieces. This historical estate in Georgetown comprises formal gardens with fountains. For the latest what-to-do in the city, get a copy of the Washington Post&apos;s Friday 'Weekend' section. DC has so many things going on behind its mask of luminous marble memorials: local musicians trumpet the blues and jazz in clubs throughout Duke Ellington's hometown, public officials debate over bills in Senate and House chambers, and connoisseurs linger in cupcake stores. Parks and Recreation −Explore the rich natural diversity of Rock Creek Park through 32 miles of trails. Two of these trails − Western Ridge and Trail Valley Trail − are popular among Washingtonians. Try to spot all three kinds of owls by horse-riding, bicycling, and picnicking. Other active pursuits are swimming in East Potomac Pool, ice-skating on Sculpture Garden Ice Rink, and golfing on East Potomac Golf Course. Opt for guided tours offered by Washington Walks, DC by Foot, Segway Tours, Old Town Trolley tours, and Dandy Dinner Boat Restaurant Cruises. Visit Frederick Douglass National Historic Site in Anacostia that most outsiders never really see. Shopping −For those who have a weakness for blueberry pancakes, the Eastern Market on Saturday mornings is the place to barter with area farmers hawking fresh produce. M Street and Wisconsin Avenue in Georgetown are lined with boutiques, designer stores, and bars. Nightlife −The capital's nightclubs are rollicking and diverse where officials and hipsters converge for after-hours bashes. The ever-trendy and multi-ethnic Adams Morgan neighborhood is replete with boutiques, nightclubs, and dining spots. The 18th Street NW and Columbia Road NW come alive when the sun goes down. Go see the sitting Lincoln or glide past stately buildings on a nighttime Potomac River cruise. There's a slew of restaurants in Atlas District and entertainment venues in Penn Quarter. 'Go-go' is a thing of the past now but, music lovers can take turns at karaoke at Hill Country Barbecue, settle in for top-notch groove at Blues Alley, catch a movie in historical single-screen Uptown Theater or Ford's Theatre, and order single-malt Scotch in a bar alongside congressman and argue over Arctic drill or tax hike. Festivals − National Cherry Blossom Festival is an annual event in March when the cherry trees around the Tidal Basin produce pink and white flowers−an event to which locals react as if it's the Second Coming of Jesus. Other important festivals are: Labor Day Concert, National Book Festival, Smithsonian Folklife Festival, DC Fashion Week, DC Jazz Festival, and National Christmas Tree Lighting.